Kling&Freitag remains a private operation owned and operated by the surviving founder, Jürgen Freitag. At the show this year, The Hannover-based manufacturer showcased in particular the Vida M, announced recently and due on the market later this year. Technical Manager for Kling&Freitag, Christoph Wöhler, explained, “Our philosophy over the past few years is based on controlled diffusion characteristics. The beam-steering speakers are meant for rooms with poor acoustics where a lot of control is necessary. Our VIDA L digital beam-steering column speakers were presented at the end of 2016, and the series was joined last year by VIDA M, a smaller version based on the same technology. Where Vida L provides a full-range beam-steering experience, VIDA M is a high-end, beam steering column primarily for speech transmission. Though it can be used with an additional subwoofer for musical reproduction, the main goal here is speech intelligibility”. The VIDA (Versatile Intelligent Digital Array) system incorporates a column of transducers, each piloted by a separate channel of on-board amplification and DSP. A dedicated control software allows real-time beam-steering and coverage control of ±45° in the vertical plane. While the larger VIDA L is a 3-way system, VIDA M is a 2-way enclosure available in a longer 220 cm version, with 32 × 1″ dome tweeters and 16 × 4″ low-mid transducers, and a shorter 110 cm version with 16 tweeters and 8 low-mids. The enclosures are controlled and monitored via Ethernet, using the dedicated software, but are also controllable via GPIO for integration into Voice Alarm systems as for audio connections, they can receive signals through built-in analog or AES3 inputs or through redundant DANTE network connections. 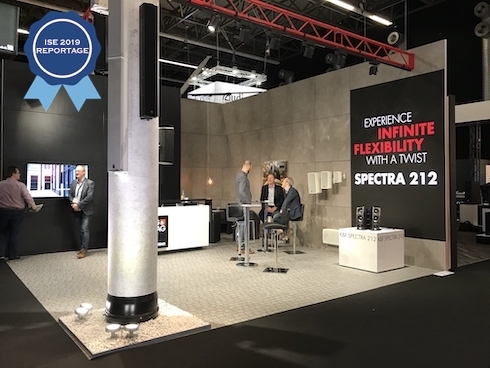 Also showcased at ISE 2019 was Spectra 212, an interesting enclosure which features two 12″ woofers in a bass-reflex configuration in a cabinet, with a removable and rotatable central module that incorporates six 5″ mid-range speakers in a closed cabinet, and four 1″ compression drivers coupled with a waveguide. With the central module installed in the vertical configuration, Spectra 212 serves as a point-source enclosure with a dispersion of 60° horizontally and +5/-25° vertically. Removing and replacing the mid-high module rotated into the horizontal configuration, instead, allows the Spectra 212 to serve as a horizontal, fixed-curve line array module with a horizontal dispersion of 30°, by 60° vertical, which can be combined in arrays of up to six units to provide up to 180° of horizontal dispersion. “The show went quite well for us,” added Wöhler, “especially the fact that our system contributed to the audio forum. The people attending the audio forum were all professionals and it was a nice showcase for our product, which was in use for the speech transmission there. 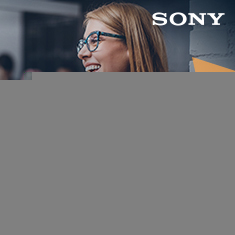 The show ISE itself is definitely becoming more and more important for the audio business and it is a good exhibition for our stronger market in installation”.